Image caption Roberto Minczuk: "The aim is to make the orchestra world class"
The Brazilian Symphony Orchestra's 2011 season seemed full of promise, with a star-studded guest line-up featuring Joshua Bell, Sarah Chang and Kurt Masur. But after three dozen musicians were fired, the Rio de Janeiro-based orchestra found itself embroiled in a controversy that has the classical music world in an uproar. Brazil is well known for its samba and bossa nova, but apart from composer Heitor Villa-Lobos, its classical music has been under-appreciated internationally. In Brazil though, the OSB, as it is known, has been an important part of the national cultural scene since 1940, when it was founded by a mix of Brazilian and European immigrants fleeing World War II. In 2005, the orchestra hired Grammy award-winner Roberto Minczuk as artistic director. His avowed goal was to make the OSB one of the great orchestras of the world. "The struggle here is to boost the orchestra to international standards, and we are far from that level currently," he told Brazilian news magazine Veja. Problems began in early January when Mr Minczuk told the orchestra's 82 musicians they would have to undergo individual evaluations. Musicians who had been performing with the orchestra for decades were outraged. "Some of the musicians had 40 years of experience in the orchestra. Submitting them to a test is like telling a doctor with a 40-year career that he has to take an exam in order to go on," says violinist Luzer David, who had played in the OSB for 23 years. At first, 56 musicians refused to submit to the evaluation. But the orchestra warned that this was insubordination, liable to penalties, and offered a voluntary resignation programme. Together with three dozen colleagues, Mr David stood firm against the exams. Under pressure, 38 others consented to take them. The foundation that runs the OSB (Fundacao OSB, or Fosb) says it tried to settle the dispute, but the musicians refused to return unless Mr Minczuk was replaced. In late April, a total of 33 musicians were fired and three had their contracts suspended. Englishman David Chew came to Brazil 30 years ago to play with OSB. He was first cellist and was about to mark his third decade with the group. "It was supposed to be a celebration, but it was the saddest day of my life", he said. "It is inhuman to fire people after so many years. They are destroying families and the community we had. It is very hard for us." The fight became public and spilled into the editorial sections of Brazil's leading newspapers. Some supported Mr Minczuk's ideas for improvement, while others sympathised with the musicians. In May, the OSB started auditioning in London, New York and Rio, and extended invitations to foreign musicians to apply. Alerted to the sackings, musicians' unions in the UK, US and France advised their members not to take part. The auditions, according to the International Federation of Musicians, were meant to "replace unfairly dismissed OSB musicians". Roberto Minczuk says some of those who were let go are pushing a "distorted version" of the facts. People would soon realise that "Fosb has always acted with integrity," he told the BBC. "I am shocked by the lies that are being spread online and in the media," said Mr Minczuk. Under Mr Minczuk, the OSB has managed to increase its budget nearly sixfold, attracting new sponsors. Musicians who are taken on are in line for an average monthly salary of $6000-$7000 (£3,650 - £4,250), he says. Brazil's minimum wage is $345. In the end, there were 251 applicants, although 102 did not show up for the auditions. Twenty-one new musicians were hired - 12 foreigners and nine Brazilians. Mr Minczuk says there is no rush to fill the remaining 12 posts. Meanwhile, the fired musicians remain united and have filed lawsuits against Fosb to challenge the dismissals. They also plan to continue performing together, as they did in late April, with a so-called Manifesto Concert in protest. All of them wore black shirts emblazoned with the slogan "SOS OSB". For the 38 who stayed with the orchestra, the situation is uncomfortable. Most took the tests and now face the resentment of former colleagues and friends. 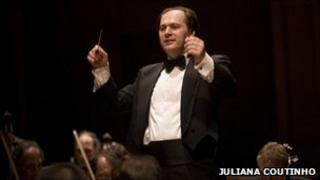 "It hurts to think that my fired colleagues will be replaced," said timpanist Rodrigo Foti. "In my opinion, Fosb should reopen negotiations with the fired musicians. "These colleagues carry a great part of the orchestra's identity." Classical music critic Joao Luiz Sampaio, of the Estado de Sao Paulo newspaper, says the OSB will have to prove that Minczuk's approach will lead to real improvement. However successful it may be, he expects that bitterness will remain for a while to come. "The evaluation in itself wasn't necessarily that bad, the problem was the unilateral manner with which things were conducted," said Mr Sampaio. "The musicians' needs weren't considered, and that was a mistake. That gets to the public and to the music world." "I think a shadow will be cast over the OSB's concerts for some time." The orchestra's new season is due to begin on 10 August with a Beethoven Festival. Audiences may be wondering how much the discord behind the scenes will play out on stage.